L 5 3/4″ (15 cm). Descending series of clear, decelerating whistles: “tee-tee-tee-teer teer.” “Zzeep” call. Description: Sexes similar. 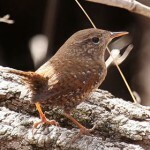 Finely mottled brown above, with rust-colored rump and tail; pure white throat and breast; and finely streaked dark chestnut-brown belly. Flattened crown and long bill. 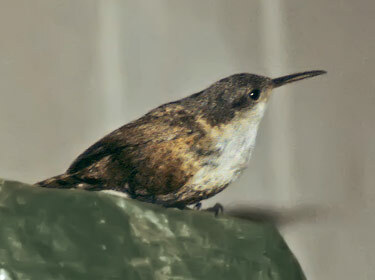 Habitat: Found in steep, shady canyons and cliffs, usually near water. Where in Nebraska: Accidental. Three records, east to Knox County. Field Notes: Has also adapted to human structures such as stone buildings and rock walls. 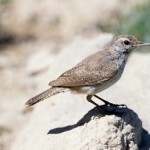 Fun Facts: Canyon Wrens do not drink water, they get their water from insects.